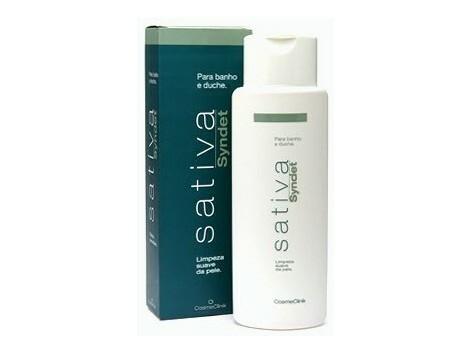 Cosmeclinik Sativa 400ml bath and shower Syndet. Proper hygiene of the skin is important to keep healthy and clean. Therefore, there must be gentle with tensiactivos little aggressive, to respect the acid mantle of the skin surface. PRESENTATION: Petaca 400 ml. Excipient: Mixed surfactants gentle and not aggressive substances retroengrasantes hydrolipid that the balance of the skin. Preserved with a mixture of phenoxyethanol and parabens. pH = 6. NOTE: For patients treated with radiotherapy, not apply the 2 hours before the meeting. If in doubt consult a specialist. INDICATIONS: For the daily hygiene of skins subjected to aggressive treatments. Emollient and soothing action of the Avena sativa protects the skin and prevents irritation caused by radiation irradiation, maintaining the optimal level of hydration. The gentle action of surfactants makes Sativa Syndet bathroom and shower can be used frequently without any risk to the skin. DIRECTIONS FOR USE: Spread a small amount on wet skin, massaging until foaming. After leaving existing 1 or 2 minutes, rinse thoroughly. ACTIVE PRINCIPLES: AVENA SATIVA: Action decongestant, emollient, anti-inflammatory and desensitizing. Ideal natural ingredient for protecting all skin types, especially the most sensitive, its capacity to act as a soothing, moisturizing and anti. CONDITIONERS CHEMICALS: emollient and soothing action that respect the acid mantle of the skin.